With influx of Fake Graphic Cards which are widely available on sites like eBay we wanted to let our clients know the difference between the good and reputed ones and those which are mainly unbranded or lesser known questionable brands. Some of these are available at dirt cheap prices but in actual they are worst then some of the on-board intel based graphic chips which are already included in the motherboard. Prices are always main priority for customers, so with platforms like ebay its very easy to fall trap into this scam, so we thought about highlighting few points so that customers can make an informed decision when purchasing graphic cards or Gaming PC which includes Dedicated Graphic Cards as a reputed graphic card or PC system no matter new or refurbished cannot match the price points when compared with a system which has these fake cards installed. When it comes to GPU, the two big names in the gaming computer industry are AMD and Nvidia. There are some third-party manufacturers and partners, who manufacture or sell graphics card that built using the GPUs from AMD or Nvidia, like Gigabyte, XFX, Asus, etc. These graphics cards cost a bit more than some lesser-known graphics cards, like Zota, which are Chinese brands. There are two categories of Chinese graphics cards. There are those that are provided by big brands and then there are unbranded ones. You can easily buy these unbranded Chinese graphics cards from Chinese retails websites, like Aliexpress. You will find good and bad, both kind of graphics card from Chinese manufacturers. In this blog post, I have listed down most of the Chinese graphics card for you, so you know how to differentiate good ones from the fake ones. So, you can create a gaming PC at an affordable cost. A Chinese brand that manufactures Nvidia GPU based graphics card at affordable rates. Apart from the affordable cards, they also cater to the elite gaming computer market with their high-end cards. They have three sub-brands, Gaming OC, iChill, and Inno3D. HIS has been around for a long time. They sell AMD GPU based graphics card at an affordable price. AMD consider them among their most trusted and preferred partners when it comes to graphics cards. This makes them one of the most reliable and affordable graphics card provider out there. Colorful is another popular Nvidia GPU based graphics card manufacturer in China. They are really popular and widely available in China, but also expanding to other countries. They manufacture graphics card for all types of gamers, including low-end, mid-range and high-end gaming computers. Sapphire is a Chinese graphics card manufacturer that provides AMD based graphics card for all types of gamers. Unlike some other Chinese graphics card, Sapphire is available worldwide. Sapphire provides reliable graphics card for gaming PC with high performance benchmark and at an affordable price. A lesser-known, but branded and authentic graphics card based in China. They manufacture Nvidia based graphics card for the local and international markets. You can visit their website for more information on their product and pricing. Another lesser-known manufacturer from China. They provide authentic AMD and Nvidia based graphics card with decent performance and affordable pricing. They are a legit brand based in China that manufactures and sells Nvidia and AMD based graphics cards for budget, mid-range, and elite gaming computers. They are not as popular as some other Chinese brands but are trusted for their authentic products. ViewMax is an authentic Chinese brand for graphics card that sells specific Nvidia GPU based graphics cards. While a trusted brand, their quality is not as good as other Chinese brands. Onda is a Chinese brand that manufactures Nvidia and AMD based graphics card for only low-end and mid-range gaming PCs. They manufacture AMD GPU based graphics card for all types of gamers, from budget, mid-range to high-end. Zotec is one of the top Chinese graphics card brands. They are available worldwide at the affordable rates. They manufacture Nvidia GPU based graphics card for budget, mid-range, and elite gaming computers. They are affordable, but they have a balance of performance and quality. If you want to buy a Chinese graphics card that is reliable and performs as good as top brands, then go for Zotec. These are some graphics card brands from China that cannot be trusted. They have no website, got no reviews, and look fake. 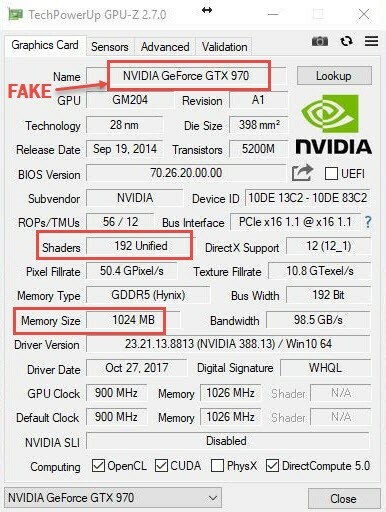 What Makes a Graphics Card Fake? Fake graphics card are sold as high-end gaming cards, whereas in reality they are low-end. You will be paying a high price for a low-end graphics card. To disguised the graphics card information from system information tools, the graphics card BIOS is changed to replace the card name with that of a higher end one. How to Spot a Fake Graphics Card? If the price of the graphics card is too cheap for a high-end card, then it is an obvious sign of it being fake. So its better to stay away from it. Before buying a cheap graphics card, always check its reviews on the Internet. Search the review websites, forums, blogs, etc. If you cannot find any reviews for the card or the review you found are all negative, then don’t buy it. Don’t take the risk of trying out your luck. To check if a Chinese graphics card is fake or not, search its photo on a search engine. If you cannot find any image of this card or the available images doesn’t match the listed graphics card then it most likely fake. If you suspect a Chinese graphics card and you have a doubt that it’s fake, then try contacting the seller. Ask them to provide the images and information of the card and its manufacturer. If they act suspicious or don’t reply back, then avoid buying from them. The most obvious method of checking if the card is fake or not is by comparing the specification listed on the card with those listed on the Nvidia or AMD website. Check information, like cores, memory type, GPU code, and Memory size. The information is same on both, then you are good to go. Otherwise, it is obvious what you need to do. If you have already bought a graphics card or got it from someone, then there is a more concrete method of checking its authenticity. Download and run tools for checking graphics card info, like GPU-Z. The tool will show you all the details of the card attached to your gaming computer. Check major specification of the card as listed down by the tool and compare it with the one provided on the card’s box. Compare information, like memory size and type, CUDA core, shaders, stream processor and memory clock. Don’t bother to compare card name or model because that can be changed from the BIOS. There are few other methods of checking the authenticity of a card. If you already have a Chinese card you want to test out, then try playing graphics card intensive games on it, like Crysis 3, GTA V or Witcher 3. Compare your performance factors, like FPS, with the benchmarks listed on the GPU provider’s website. You can also check the model of the graphics card by directly checking the hardware. Remove the fans and cooler from your card, clean out the thermal paste and you will see the processor of the card. Compare the model number mentioned on it with the one listed on seller’s website or graphics card box. If it’s different, then you have been scammed. As mentioned before, not all Chinese graphics card are of low quality or fake. There are some branded graphics cards that are available and sold worldwide. These brands are as popular as big ones, like Gigabyte, Asus, Palit or MSI. However, since there are also fake ones in the market, you should the know difference between the real ones and the fake ones and how you can spot the fake ones so you don’t end buying it.